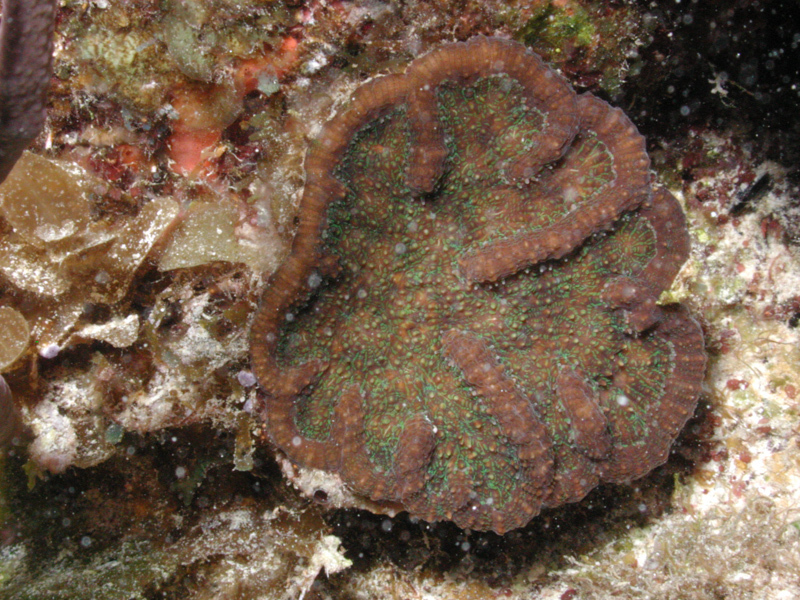 Anything with chlorophyll – green plants on land, seaweeds and symbiotic algae in corals underwater – emits a characteristic deep red fluorescence. Chlorophyll’s job is to capture light and convert it to chemical energy for photosynthesis, and it is very good, but not perfect, at doing that. 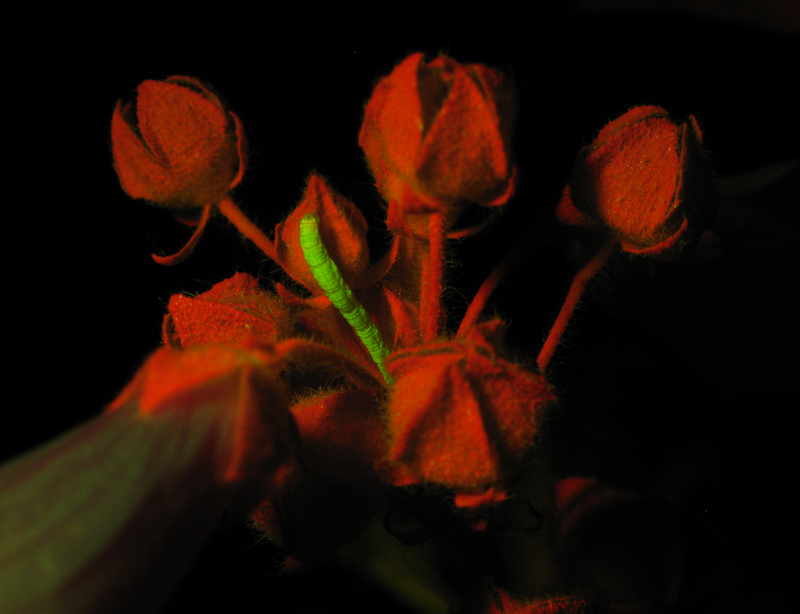 Some of the incident light always escapes as fluorescence – not a lot, somewhere around 1%, but enough to see and photograph with the right illumination. The photos below show a portion of a plant in white light and fluorescence. The inchworm is well camouflaged against the green color of the plant under normal illumination, but it fluoresces green and stands out like a sore thumb against the red fluorescence of the chlorophyll. The next photo pair shows a coral with algae in the background photographed with a white-light flash and the same scene in fluorescence. 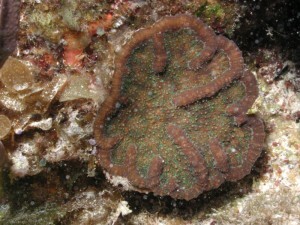 The brown in the coral in the white-light shot comes from the symbiotic algae. 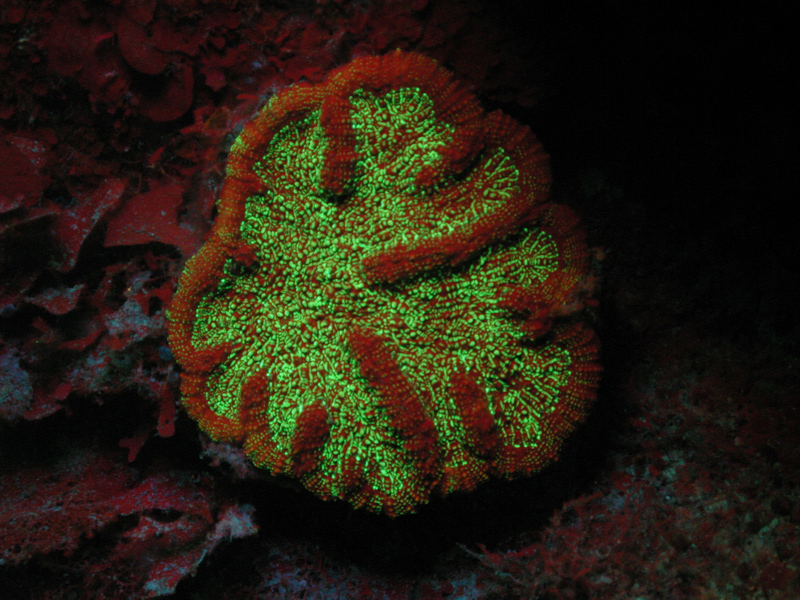 In the fluorescence shot, the bright green comes from fluorescent proteins in the coral tissues, while the red is from chlorophyll in the symbionts. There is also red fluorescence from the algae around the coral. Chlorophyll fluorescence in plants has a property that lets you play a neat photographic trick. 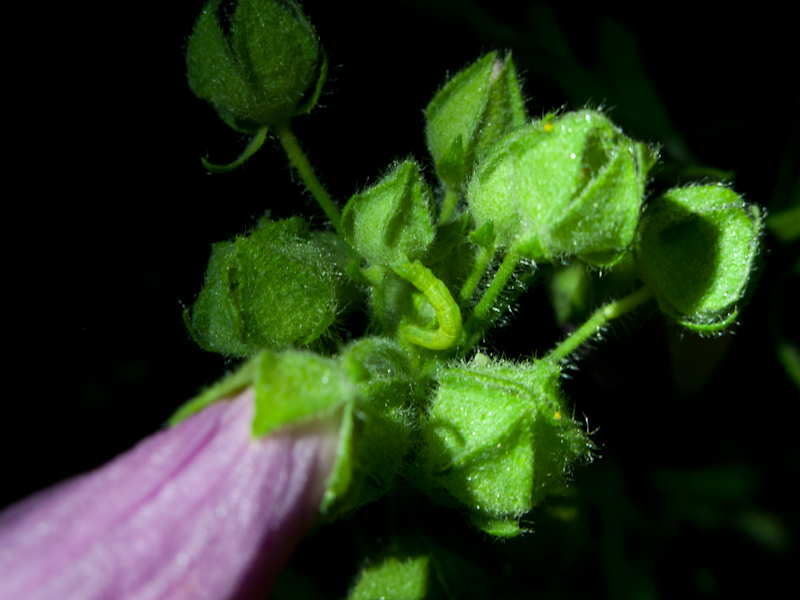 When a plant is in the dark the photosynthetic mechanism shuts down. When the plant is then exposed to light the reaction centers where photosynthesis takes place kick into action. Since all of the reaction centers start out ready to do photochemistry they use most of the captured light and little comes out as fluorescence. This is called photochemical quenching. As the reaction centers become saturated the fluorescence increases, rising to a maximum over the span of about 0.5 – 1 second. After this the fluorescence slowly decreases until it reaches a steady state. This decrease is attributed to both photochemical (an increase in the efficiency of the photosynthesis process after it is first activated) and non-photochemical (other processes that protect the plant against excess light) effects. This behavior of chlorophyll fluorescence is called the Kautsky effect, named for Dr. Hans Kautsky, who first described it in 1931. The effect is also called fluorescence transient, fluorescence induction or fluorescence decay. We used the Kautsky effect to take a ‘phantom’ image of a paper clip. 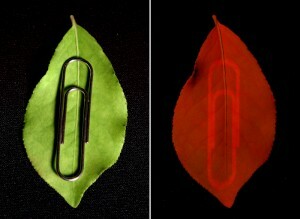 Paper clip on leaf in white light, and fluorescence afterimage. First we put a paper clip on a leaf. We turned off the lights for a few minutes to allow photosynthesis to shut down, then turned them back on. We waited about 10 – 15 seconds to allow the fluorescence in the exposed part of the plant to go through the rapid rise and slow fall of the Kautsky effect. We then removed the paper clip and quickly took the fluorescence photograph while the fluorescence was in its high intensity phase. This brighter emission from the areas that had been covered produced a perfect glowing afterimage of the paper clip.